While studying Chinese ceramic history at Jingdezhen Ceramic Institute, I produced several poorly crafted imitations of traditional pottery forms from various dynasties. After learning to barter in the local language, I took these forms to a black market, and attempted to hawk them as authentic artifacts. Playing the role of the “mountain bandit,” my Western presence performance complicated the idea of shanzhai (knock off or counterfeit consumer goods). 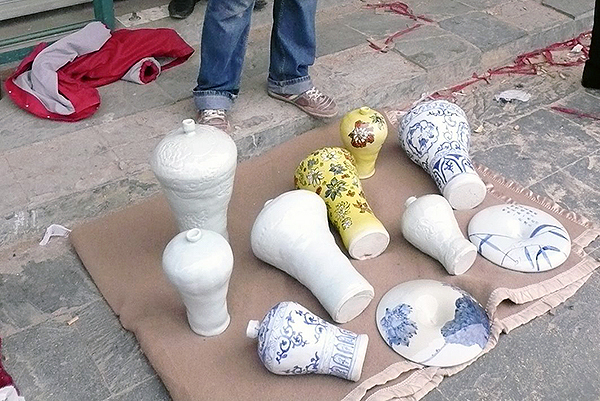 Infringing on the brand of traditional Chinese ceramics, Black Market was a spectacle met with confusion and bewilderment by passersby.